This unprecedented event pairs National Geographic’s stunning natural history footage with an original symphony composed by Bleeding Fingers Music, performed live by symphony orchestra and members of the Royal Melbourne Philharmonic Choir (prepared by Andrew Wailes). Driven by a five-part composition, Symphony for Our World combines artistry and science as it brings viewers from the depths of the sea, up to the coastlines, onto land, through mountains and into the sky. Each movement results in a powerful musical tribute to the beauty and wonders of our wild world. The 90-minute show is packed with ground-breaking imagery and storytelling from 130 years of beloved National Geographic history. 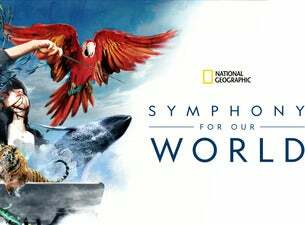 Symphony for Our World is officially licensed by National Geographic and produced by Jason Michael Paul Entertainment. Approximately 1 hour and 50 minutes, including a 20 minute interval. Please call Arts Centre Melbourne directly if you have Wheelchair, Companion Card or Special Needs booking requirements.